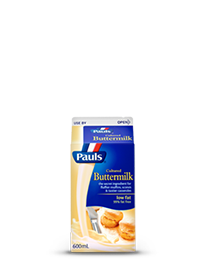 Combine warm buttermilk with yeast in a bowl of an electric mixer. Stir in the eggs, lemon, zest, half of the sugar and half of the rosemary and then add the flour before turning the mixer on low to form a soft dough. After 1 min add the butter and beat for another minute until the dough is shiny and thick. Turn the dough out into a large oiled bowl and roll the dough in the oil before covering the bowl with cling film and leaving to rest in a warm place for 11/2 hrs. The dough should double in size. Grease a 20cm round springform cake tin then knock back the dough by lightly punching it in the middle. Move the dough to the prepared tin and press to the edges. Arrange the plums cut-side up and gently press into the dough. Cover again with cling film and allow to rest for 30 mins. Preheat the oven to 200ÅãC and sprinkle the dough with the remaining sugar and rosemary and bake for 10 mins before reducing the temperature to 180ÅãC and bake for a further 20 mins or until golden.